Every bar has those bottles that it considers “top shelf.” These are spirits that are usually rare, delicious and, yes, expensive. Every now and then, the bartender reaches for one of these bottles to serve a curious customer or fulfill a special occasion request. But for the most part, the top-shelf bottles sit collecting dust, serving as little more than a backdrop for the more common spirits that are constantly drained and replaced. At Big Orange Midtown, that’s changing. Starting today and going through the holiday season, the restaurant is offering a second cocktail menu full of mixed drinks made from some of the finest spirits you can buy. This doesn’t replace Big Orange Midtown’s existing cocktail menu (which we found to be superb). Instead, it’s a special alternative menu to give you a chance to try some liquors you might never get to taste otherwise. It’s also a chance for Big Orange Midtown’s excellent bar staff to flex their creative muscles. Before you can even place an order for one of these rare cocktails, you have to request to see the menu; it won’t be set out on every table. This is meant to be special, and it delivers. 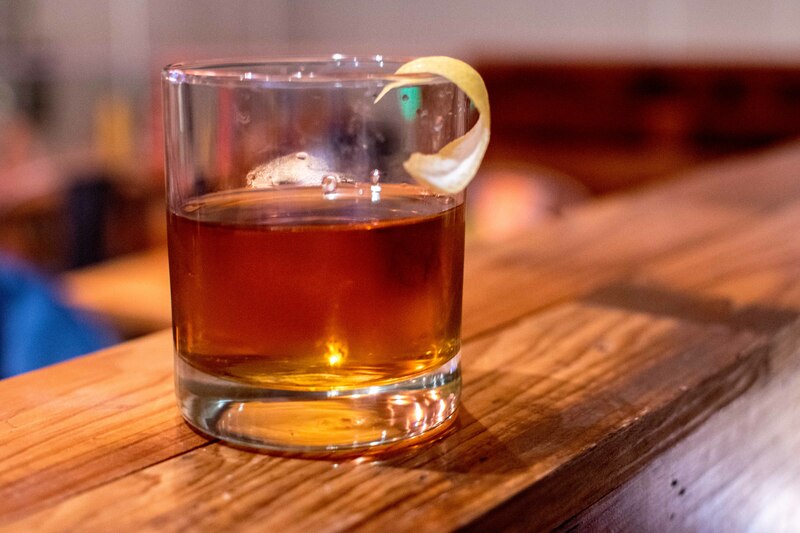 Take the Grand Cru Bijou ($28), which combines Green Chartreuse VEP, Citadelle Reserve gin and Carpano Antica vermouth. The Chartreuse VEP alone runs $160 per bottle or more, meaning it’s not something you’re going to run out and buy every day. This is an exceptional cocktail, one that starts out with sweet orange peel flavors and develops into a more earthy drink that keeps its balance throughout. The price tag is also impressive, but again, this is a special menu for special occasions, and the cocktail does not disappoint. 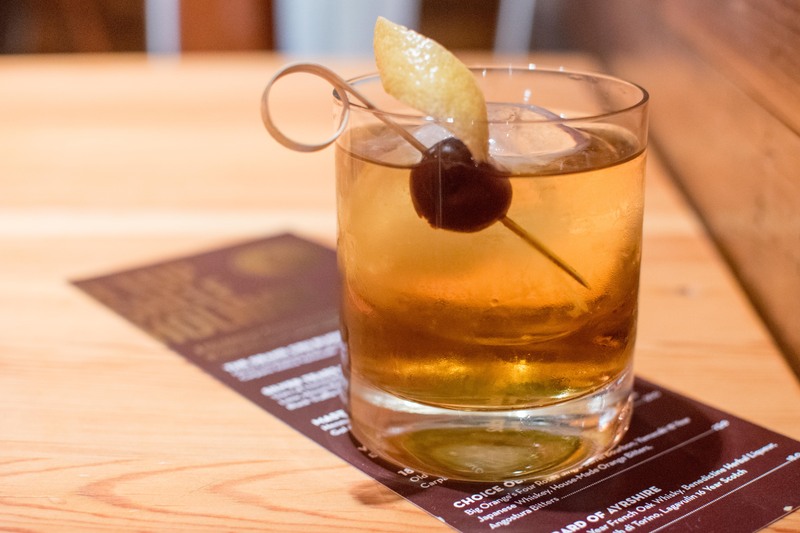 You might scoff at the inclusion of a common cocktail here, but Uzcategui has included two tremendous whiskeys in the Choice Old Fashioned ($23) that make this drink anything but ordinary. Big Orange’s Four Roses Single Barrel bourbon is mixed with Yamazaki 18-Year Japanese Whiskey, as well as two kinds of bitters for a polished presentation of this timeless tradition. This is a whiskey lover’s dream, with the Yamazaki especially noticeable on the very long finish. Finding a bottle of the 18-year is no easy task and would run you about $600 on its own. 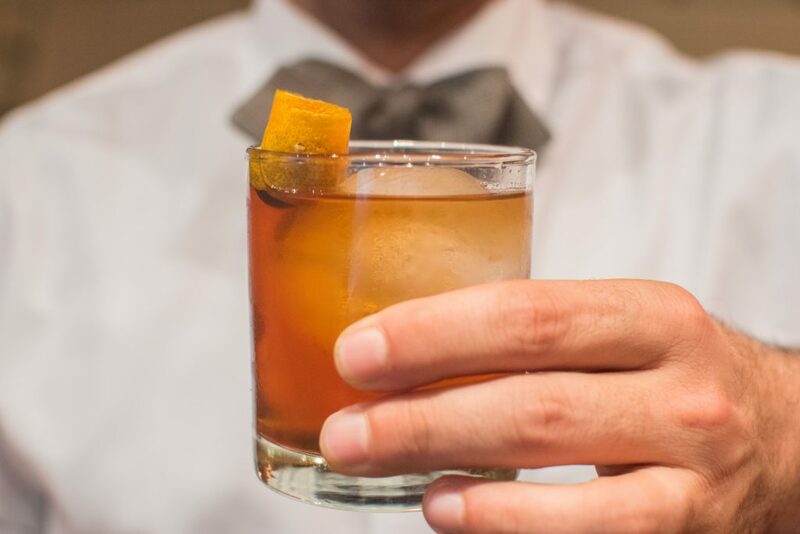 So while an Old Fashioned might seem too commonplace for a special menu, this particular cocktail might actually be the most rare of them all. Cocktail enthusiasts looking for a more relaxed drink should try The Bard of Ayrshire ($18), an ode to the Scotsman Robert Burns who penned the New Year’s song “Auld Lang Syne.” The cocktail starts with a rinse of Lagavulin 16-Year Scotch, which gives a smoky nose to the Glenlivet 15-Year French Oak whisky, Benedictine and Cocchi Torino. This is a delicate sip that is quite good, even if it doesn’t make the same large impact that its price tag does. Still, it is well-designed and elegant, and appropriate for a quiet drink at the end of a long day. For those of you looking for the powerful punch on the menu, look no further than the Silver Tears Margarita ($50), which is easily one of the most complex and surprising cocktails I’ve ever experienced. It starts with Tears of Llorona extra añejo tequila and adds silver-infused Grand Marnier, lime juice and house-made honeysuckle blossom water. 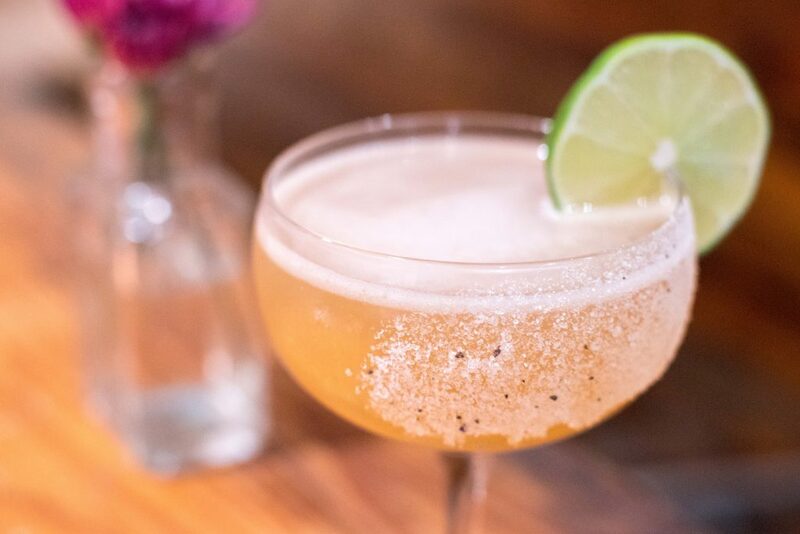 The cocktail is then served in a glass with a black truffle salt rim on one side. The black truffle is immense on the nose; indeed, it’s so strong that a mere whiff of it while you sip completely changes the flavor of the cocktail. But turn the glass around and taste the truffle with the margarita, and you have something special. Instead of drowning out the tequila, which I thought would happen, the truffle highlights the blue agave flavor, almost dancing with it in notes of smoke, citrus and vanilla. It’s a flavor that continues for a full minute after you sip, meaning this investment won’t be done right away. It is a steep price, but if you can afford it and you have some extra time to enjoy a surprising cocktail, it won’t let you down. This is an extravagant, indulgent menu that Uzcategui has concocted, and that’s not a bad thing. Big Orange has always been an excellent bar for cocktail and craft beer lovers, and now it’s having some fun. The “Top Shelf Holiday” menu won’t be for everybody. But if you have a special occasion, or if you just really want to explore flavors that you might not have ever experienced, do yourself a favor and drop by Big Orange Midtown before Christmas. You have only a few weeks for a very rare treat.